I am the mother of 4 daughters. My oldest daughter, Brandi, was 29 when she started having stomach issues. She had never missed a yearly checkup with her Gynecologist. Her papsmears had always been normal and her monthly cycle was regular. Brandi did get off her birth control 6 months or more prior to these issues. She saw 3 different doctors and received 3 different diagnosis! Urinary tract infection, constipation and gallstones. She was having severe stomach aches and backache. None of the prescribed medicines gave relief. Theses symptoms were severe enough to keep her in the bed in tears on a heating pad! She made an appointment with a gastro doctor. Another diagnosis, C-Diff. Sent home with a bland diet and a $600 prescription. She immediately lost weight which was chalked up to the diet. You see she was 5’9″ weighing 130. So any weight loss was very noticeable! On her return check up the doctor was extremely concerned with the near 30 pound weight loss in 2 weeks. It was at this visit that he could feel a large mass in her abdomen. She was immediately referred to a Gynecological oncologist. Her CA-125 came back over 300! Normal range is 0-30. After 6 months of being misdiagnosed we had an official diagnosis, Ovarian Cancer. Surgery to de-bulk was scheduled within days. A tumor the size of a football was removed along with her uterus, ovaries, spleen and appendix. Cancer was left behind on her spine and liver. A tumor that was too high up in the abdomen had to be left. So we knew at that point Brandi would never be cancer free! But her oncologist thought he could get her to remission and keep her there for a few years. Chemo started 3 weeks after surgery. After a bowel blockage that nearly took her life she did achieve remission! She was placed on a maintenance chemo for the next 6 months. By the following year she was hospitalized again. This time a scan showed the cancer had traveled to the brain. A floating tumor the size of a golf ball. Within hours of a CT scan she was whisked off to surgery on her head. A choice had to be made, start chemo again or radiation to the head to prevent re occurrence. Radiation was chosen. We were fortunate enough to have an awesome gynecological oncologist that immediately signed her up for a clinical trial. We made the initial visit, signed over the brain tumor and all test results. She was to start a chemo pill by mouth. But the radiation really took its toll on her body and cancer was rapidly growing in her abdomen. Her bowels by this time had begun to fall apart. All treatment had to cease. We heard the words, there is nothing else we can do. Brandi passed away on March 10th 2012. She was 30 years old. Brandi gave it all she had for 15 months.You see young women don’t fit the criteria for the diagnosis of Ovarian Cancer. Brandi tested negative for the hereditary gene that causes this disease. A few weeks after her passing I attended a Strike Out Ovarian Cancer softball game at LSU under the coaching of Beth Torina. Her mother is an Ovarian Cancer Survivor! After brainstorming with friends one sent coach an email. We met with Coach Beth a few weeks later and planned our 1st walk to bring awareness! GEAUXTEAL was born. I was able to keep a promise to Brandi. Spread the word about this silent killer! Thank you to all that work so diligently to spread awareness and raise money for research! The one thing I learned that is so important is this, when a woman of ANY age starts having any kind of stomach issues, visit your Gynecologist first! Rule out female problems, then see a gastro Dr. Thank you for the privilege of telling Brandi’s story………. My name is Arcangela Lopez. On September 2014 I was diagnosed with Plural Peritoneal Carcinomatotis, an Ovarian Cancer. The reason I want to share my story with you is because of the way the cancer was found. For few months, almost all summer 2014 I had cough fits that would become more and more frequently. I went by family doctor several times for the cough, treated as an allergy, took lots of allergy medicine, antibiotics, and etc. Meanwhile the cough would become worse. In September I developed pneumonia. Treated with antibiotics by a family doctor, but the cough would not go away. I decided to go by a pulmonologist, Dr. Richard Yan, prescribed a CT scan of the lungs. The CT showed I had fluid at the bottom of my lungs, by the abdomen; therefore Dr. Yan prescribed a full body CT that showed two tumors in the pelvis area, an ovarian mass. In April 2014 I went for yearly OBGYM visit and was told everything was normal, therefore did not need a sonogram. I never had pain or discomfort or bleeding to suspect that something so bad was growing in me. A doctor from NYU Langone Medical Center operated on me on October 13th, 2014. It was a stage 2 ovarian cancer. I had 18 sessions of chemotherapy at the Permutter Cancer Center. Since March 30, 2015 I am in remission. I go every three months for checkup and CA125, always pray for the best. Hope my story will inspire everyone to listen to your body. Do not hesitate to consult a specialist. My mom was diagnosed with stage 3 ovarian cancer last April. She had surgery to remove tumors from the lining of her stomach, ovaries, and gall bladder. She continued chemo treatment to remove the rest. By January, she complained of stomach issues, and we found out she had a bowel blockage. After 2 months of trying to remove the bowel blockage, her doctor decided to take her off chemo treatment, and put on hospice care. I was 9 months pregnant and unable to fly from Massachusetts to Georgia where she lived. She found the strength to fly up to Massachusetts with the help of her brother. She spent 11 days with me, family and friends before the baby was born. She met her first grandchild and died 3 days later when we returned home from the hospital. She was 66-years-old. 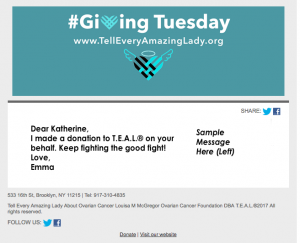 I’m an ovarian cancer survivor that was diagnosed at 19. I woke up from a surgery to remove tumors to discover I had to have a full hysterectomy. I am now 29 and unable to have children of my own. It’s difficult to relate to anyone that is older that has already had children. If you or someone you know is similar to my age or situation that cannot have any children please feel free to contact me. It would be nice to have someone I can talk to who understands. Hello. I lost my mom to ovarian cancer in October of 2014. She was 91 years old. She was diagnosed after having gone to the doctor with pains in her stomach (and a very bloated stomach). They did a cat scan and discovered she had cancer in the lining of her stomach but that it did not originate there. They were 95% sure that the cancer originated in her ovaries. At 91 years old she wasn’t strong enough nor did she want any intervention. They gave mom up to 6 months to live but she died in 3 weeks. My mom and I were so close. She lived with me and my young daughter for the last 3 years before she was diagnosed. I miss her every moment of every day. I am going to walk for this oh so important cause ‘TEAL’. Thank you for reading this.